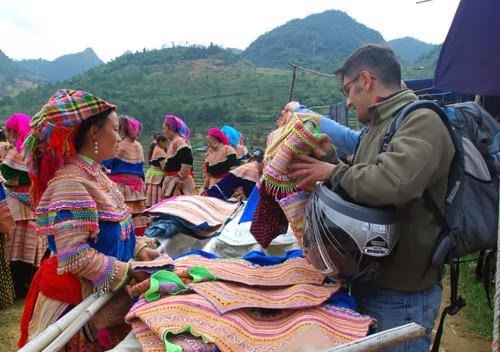 Location: Si Ma Cai market is 27km from Bac Ha, 98km from Lao Cai City and 135km from Sapa. Si Ma Cai is not as frequented as Bac Ha or Sa Pa, also located in the mountainous province, since it is nestled at the far end of a road near the border with China.The name Simacai means “horse market” in H’mong language and old peoples said that it was the biggest horse market of the region. However, life is changing fast and horses are not the only purchasing objects nowadays. The market place is simply a large ground near the recently developed town let of Simacai District with some thatched huts built to accommodate shops and food stalls. In recent years, the charms of Si Ma Cai have been awakened and have become attractive to travelers due to the flower-colored clothes of the Mong and Red Dao ethnic peoples, by the greenery of mountains and hills, and by the legends. Every Sunday, Simacai market attracts some thousands of Flower H’mong, Zao, Phu La peoples from villages in the region come to shopping, enjoying themselves meeting friends and relatives…after hard working days. They spend most of their time at the market talking, chatting and also drinking a lot. Where To Go In Order To Enjoy A Summer Vacation In Vietnam?